Born in Bridlington, a small seaside town in Yorkshire, Charlie Heaton had never thought about being an actor. Charlie and his older sister Levi were brought up by his mother in public housing after his parents split and his father moved to London. At 16, Charlie moved to London to live with his dad. His uncle had a recording studio there and Charlie played with several bands. After graduating from college, he joined a punk band named Comanechi as their drummer. He toured the world with them for a year, but when they got back, he was broke. Levi, who was trying to make it as an actor, suggested Charlie come along with her to a commercial agency when they held an open day. He was chosen and started going to commercial auditions. Although he hated the things he was asked to do, he landed one that was an eight-minute Swiss advertisement with a real story arc and characters. It went on to win a Cannes Lion. Through that, he landed a talent agent and began auditioning for real roles. In 2015, Charlie landed guest appearances on British series such as DCI Banks (two episodes), Vera (Levi also appeared on the series in 2015, but on a different episode), and two episodes of the BBC One drama Casualty. During that time, Charlie also landed a talent agent in Los Angeles, and was told to travel to the States in January 2016 for pilot season. Through his TV appearances, and working at night in a bar, Charlie earned enough to do just that. He flew to L.A. and stayed in a hostel with backpackers. Charlie's first big movie was the 2016 psychological thriller Shut In , in which he starred alongside Naomi Watts. After Shut In , Charlie landed two more dark, challenging roles — public housing junkie Frank in the 2015 British drama Urban & The Shed Crew (2015) opposite Anna Friel and Richard Armitage; followed by the adolescent-themed indie As You Are , which won a Special Jury Prize at the 2016 Sundance Film Festival. 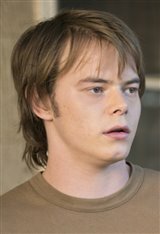 Next came the role of Jonathan Byers, the teen brother of a kidnapped boy in Netflix's smash hit Stranger Things. The show went on to become one of the most successful shows in Netflix history and Charlie has finished filming a second season of the series. He has also since filmed the psychological thriller Marrowbone (2018) in Spain, alongside Ana Taylor-Joy. Charlie began dating his Stranger Things co-star Natalia Dyer just after filming on the first season began, and they are together still.